Yesterday marked the day for updated iPod models revamped after three years of idleness and being left out. Not just a single variant of iPod has been toyed with but all of the existing variants are revamped in their own ways. iPod shuffle and iPod nano have received new color options which are by far more pleasant to the eyes than the previous ones. In the category of the iPod Touch, it has received a more advanced level of upgrade. The 6th generation iPod touch have upgraded itself from a 5 megapixel rear facing camera to an 8 megapixel. It features Apple’s first ‘M’ series processor which would make it a faster device. Starting of with $199 for a 16 GB model, Apple has not really changed prices by a lot. However, one thing that just came up translates that the iPod Nano and iPod Shuffle are not compatible with Apple Music. What’s an iPod without Apple Music? iMore has confirmed that the two aforementioned variants, iPod Nano and Shuffle, will probably never be compatible with Apple Music in terms of the music streaming service. The news is heart tearing for all iPod lovers out there. Even though the two variants did not hosted any Wi-Fi capabilities, it was assumed that Apple would adhere them to be used as devices which can sync offline listening tracks and playlists from Apple Music. 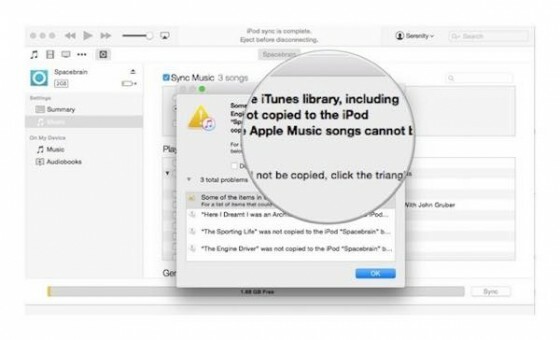 When we try to sync; iTunes deny to copy songs from Apple Music. This gives users a false expression of the two devices. It is presumed by users that only color upgrade defines the demise of the two music players. Possibly, the lack of support for Apple Music means that Apple will soon get rid of its iPod Nano and Shuffle lineup soon. It can be sensed that Apple does not have any future plans for non-iOS holding iPod variants. The iPod Touch has been revamped in many aspects and users expect Nano and Shuffle to be treated the same. Apple could have added support for offline listening just as it did in the Apple Watch. The Nano and Shuffle may lose potential sales due to the reason as no internals are changed, hardware or software except for several color options. This is it for now, let us know how you guys feel about the lack of Apple Music compatibility on iPod Nano and Shuffle.